Have you ever tried to iron your garments with a poor excuse for an iron? Pushed so hard to get the wrinkles out, that you thought your arm would start cramping up? Or wanted to simply throw your iron out the window because it frustrated you so much? Never fear, the Swan ceramic sole plate iron is here to rescue you from your ironing woes! This Swan iron lives up to all my expectations when it comes to a quality household iron. With its 2400W power source, it heats up quickly and evenly. You will find it easy to use and a breeze to maneuver around your clothing. The ceramic sole plate glides effortlessly on a huge variety of fabrics. From cottons to silks, there is a temperature setting for even the most delicate of items. The Swan ceramic sole plate iron comes with a convenient dry/spray/steam/variable steam control dial and has a vertical steam shot feature as well. The dial is well labelled and easy to access, making it simple to change settings to fit your ironing demands. With a steam output of 30g/min and a shot steam output of 100g/min, you will never have to worry about getting that perfect steam ironing job done right the first time. This ceramic iron also has a self cleaning feature that prevents lime scale build up and has an anti-drip feature to keep those vexing water stains away from your clothes. The self cleaning feature works quickly and efficiently so you don’t have to scrub or scour. This feature is perfect for anyone that has hard water, rust filled water or no water softener. It prolongs the life of your iron so it will continue to do what you need it to. With a weight of 1.4kg and a water capacity of 350ml, the Swan ceramic sole plate iron is a lightweight iron that still packs a punch when it comes to ironing. No need to press down on your fabrics with brute force. Just let the iron work for you, and glide it effortlessly over your garments and the wrinkles will fade away. A 3-meter cord makes ironing anywhere in your home uncomplicated. Just plug it in and the Swan iron will heat quickly. As with any iron, before using it for the first time on any fabric, turn the iron on and iron a tea towel or loose piece of fabric. There usually is a small amount of coating from the manufacturer that can harm your delicates if you don’t follow the instructions and do this simple step first. Lastly, the soft grip handle is extremely comfortable in hand while using the Swan Ceramic Sole Plate Iron. Made of a soft pliable material, it almost molds to your hand to add extra relief when doing one of life’s most unenjoyable chores. There is a rubber finish at the base of the iron, so standing your iron up is very safe. The rubber hugs the surface so no slipping happens when you aren’t using the iron. Across the board, this ceramic iron coming from the Swan brand is a solid device. 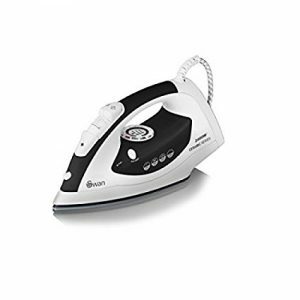 With its aesthetically pleasing black and white color combination, easy to read dials and lightweight design, this iron is worth the funds. 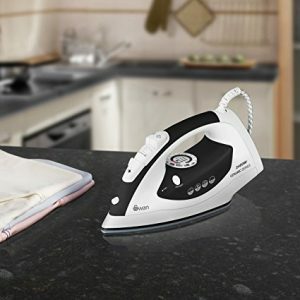 With those extra features like self cleaning and anti-drip, as well as numerous heat settings and steam shot output, this iron will accomplish any of your ironing jobs with precision and ease. At a reasonable price point, the Swan Ceramic Sole Plate Iron is a solid investment for your household and for keeping your clothes in tip top shape. Try your hand with this iron and you’ll have very little to complain about accept having to iron in the first place!